Unique Art Gallery of the planet’s best Mobile Digital art, created on iPhones and iPads, uploaded by artists around the world and curated into the gallery established in July of 2009. Recognized by the esteemed ARTnews magazine in December 2009 as “the” Online Gallery exclusively showcasing Mobile Digital Art. The apps in the listing are linked to the iTunes app store, making purchase quick and easy. 30 examples of iPhone and iPad artwork are built into the app's home screen. This art is linked directly to the apps used to create them to demonstrate and educate the aspiring Mobile Digital Artist and get them started. Slideshow mode for viewing artwork. 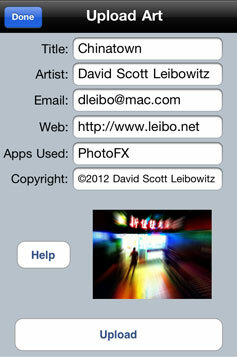 Artists, participate by uploading your Mobile art for inclusion in the iCreated Gallery. iCreated is a free resource of information, education, iPhone / iPad Art and inspiration!